The story behind the name: Ara, the altar, is a constellation with a complex history. Originally, Ara was referred to as an altea, an incense vessel, or an altar with burning incense. The Greeks (and perhaps the Romans before them) referred to Ara as Tul-Ku, meaning "Holy Altar", which was an archaic Euphratean figure in the zodiac. 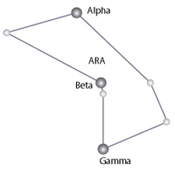 It was then replaced by Libra when the Greeks adopted Ara and moved it to the present constellation. The Arabs called the constellation Al Mijmarah, borrowed from the Greeks and means "The Censer". The Romans identified it as Thymele, the altar of Dionysus, and Ara Centauri, "Centaur's Alter". 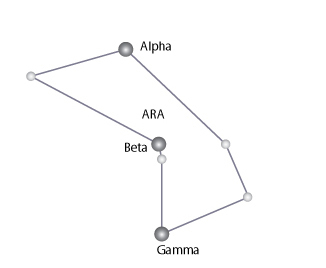 Ara Centauri came about in the classical times where Ara, Lupus, and Centaurus were one constellation. Among all the references to the constellation, the name Turibulum, "Censer", from the Romans claimed victory as the title until the 18th century. In the 18th century the name Ara was given to the constellation and it became associated with the mythological story written by the Roman poet, Marcus Manilius. The story said that Ara was the altar where Zeus and his fellow gods took vows before defeating the Titans. In the biblical schools it became associated as the altar of the stories pertaining to Noah and Moses. In the contemporary times, Ara is normally represented as an incense burner and is drawn as such in the constellation depictions.